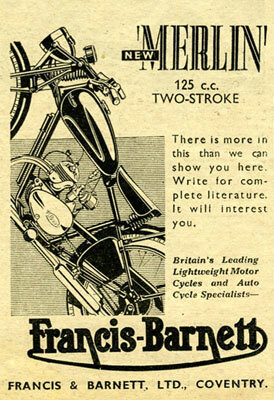 Francis Barnett was one of a wide array of small motorcycle manufactures in the United Kingdom. These companies enjoyed their heyday from the late teens through the early 1960s. In the 1960's these companies were drummed out of existence by quality control problems and the appearance of low cost high quality motorcycles from Japan. Francis Barnett was founded in 1919 by Gordon Francis and Arthur Barnett. The two men, related by marriage, set out to manufacture quality inexpensive motorcycles. Francis and Barnett started out using engines made by such companies as JAP, Villiers, and Blackburn. Later on they would concentrate on Villiers engines. In 1923 the company began using frames made of many straight tubes bolted together into a rigid frame. This rigid straight tubed frame led to their," built like a bridge" motto. Due to the lack of welding and bending this frame was easy and quick to produce, thus lowering costs. In 1928 and 1929 the War office experimented with FB models. In 1928 they looked at a one off Model 9 FB. In 1929 the War Office tested a set of FB Empire Model no. 12 two strokes. The war office both times went with other manufacturers. This was mainly due to a concern about the durability of a two stroke engine. Through the 1930's Francis Barnett continued to produce a range of models that went from small items such as the 98cc Powerbike (basically a motorized bicycle) on up to Plovers and Cruisers. In 1939 Francis Barnett introduced the 122cc Snipe. Production would be short lived as Great Britain was soon embroiled in World War II. In 1941 the War Office purchased an unknown number of 150cc Plovers to experiment with. They eventually chose James and Enfield to manufacture the airborne lightweight motorcycle they were looking for. This decision may have been due to the bombing of the Francis Barnett factory. After the war Francis Barnett dove back into production of their lightweight range. There was a need for lightweight motorcycles in the continued rationing of postwar Great Britain. The Merlin L.51 was advertised as being able to go 250 miles per tank (about two gallons.) The Merlin seems similar to the pre-war Snipe. The main advances appear to be in the Villiers 9D 125cc engine and the folding rear fender mounted to a new carrying rack. The Merlin L.51 began production in 1946 and ended after minor modifications in 1952(?). Nothing is known about my motorcycle prior to its appearance on ebay in 1999. 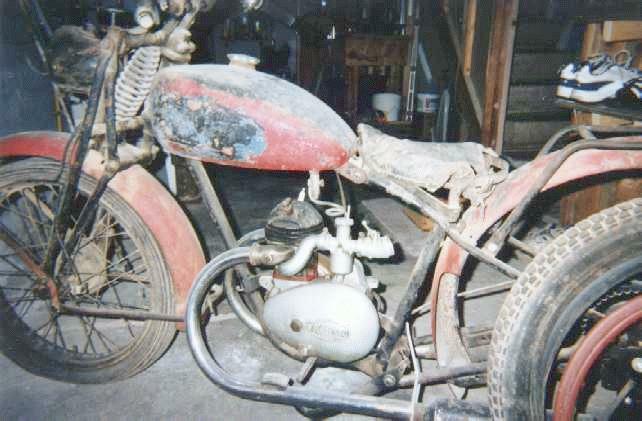 A Canadian fellow found it among his grandfather's possesions and put it up for sale on ebay as a James motorcycle. 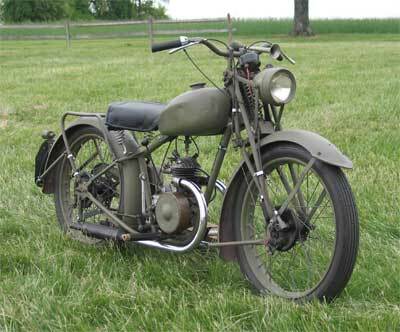 I had been looking for a wartime James or Enfield due to their use as airborne motorcycles. To pick up the motorcycle I drove up to Rochester New York in an old Volvo that left a trail of parts behind it. At one point a trucker blocked an intersection around 2 am in a small town and marched back towards the Volvo. All he said was," Son, you know when you turn your high beams on?" "Yes, sir I said." "well, don't, because all your other lights go out and we can't see you." Apparently I had become quite a road hazard that night. The motorcycle looked worse when I picked it up then it did in the ebay picture to the left. The piston was pitted, the rings were broken, an exhaust mount was snapped off along with a seat mount, and there were no wires or cables to speak of. To top this off the rear wheel was a pile of spokes and a rim. I spent a year sandblasting the motorcycle, taking it apart, and trying to discover what it was. The serial number matched nothing produced by James. As with the other vehicles the internet came to the rescue. I found the British Two Stroke Club online. The President of the British Two Stroke Club informed me that my motorcycle was by "odd coincidence" a Francis Barnett Merlin L.51 The coincidence is that my nickname has been "Merlin" for years. FB did some exportation of FB Merlins to Canada in the late 1940's. This is evidenced by a couple other FB Merlins that have appeared recently in the Great White North. Currently there are eight FB Merlin 51's known to exist in North America. The internet also helped me find the wonderful folks of the Francis Barnett Owners club, the British Two Stroke motorcycle list on yahoo, and the fellows who run Villiers Services. Villiers Services supplied everything from engine parts to the seat and some cables. At one point I was very lucky and stumbled across manuals for the Merlin on a British museum's website. If I find that website again I will add it to the links. With the help of Villiers Services and such friends as Scott Roberts, Bill Max, John Novicki, and Brian Nehri we rebuilt this motorcycle into a working machine again. (Help also came from fellow FB Merlin owner Gerry de Vries who would often send emails of his latest accomplishments with his basket case. Then I would feel obliged to catch up.) The Villers engine was completely rebuilt. After the engine rebuild we found we had made it too tight, and had to turn it over many times to loosen it up. When the motorcycle finally did start at my friend Bill's home I rode it down the dirt road in great excitement. Whizzing along leaving a blue cloud behind me I joyfully noticed that the old speedometer still worked. It was then I remembered that while I was going happily 25 miles per hour, I had not hooked up the brakes yet. My heavy boots served as stopping power that day. When I worked on the brakes I found that luckily the bike came with new brake pads. The front brake cable was improvised from a Sturmy Archer cable, and parts scrounged from various other motorcycles. It was quite a puzzle trying to figure out the rear brake installation. One major bracket was missing which I made a replacement for. We had to improvise many times while rebuilding this motorcycle, but we never sacrificed the strength of the parts as I want the motorcyle to be safe and street worthy. I found tires through J.C. Whitney. The tires are the correct size and are now made by Cheng Shin. 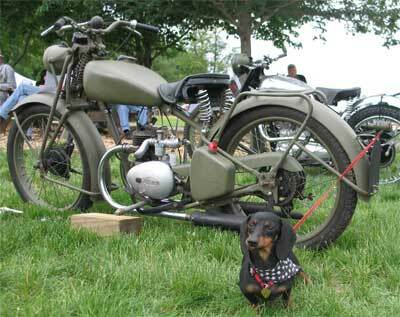 In 2004 the Merlin took an honorable mention at the Butler's Orchard motorcycle show in Maryland. 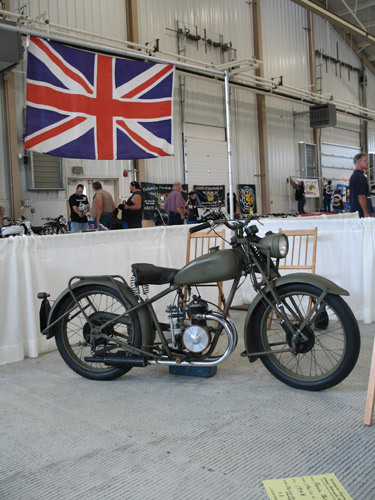 In October of 2005 it took first place in the British Division at the Westminster Maryland Antique Motorcycle Show. Currently the motorcycle awaits a stand and the installation of wiring. It is Wartime Green due to its similarity to wartime motorcycles. The Merlin is often used at WWII Living History displays. Someday if I acquire a wartime James ML the Merlin will be restored to proper post-war colours. Collecting, Restoring and Riding Classic Motorcycles. By Tim Holmes and Rebekka Smith. British Forces Motorcycles 1925-45. By C.J. Orchard and S.J. Madden. Villiers Services (UK 01384-265797 Calling works better than emailing them.